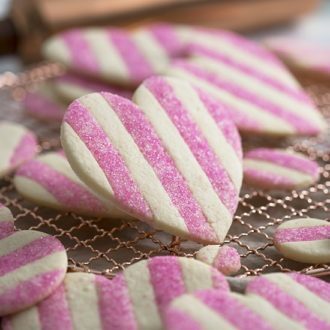 These show-stopping pink and white striped sugar cookies have a touch of sparkle thanks to some pink sanding sugar and make for a perfect Valentine's Day treat! Sprinkle ¼ cup pink sanding sugar to one batch. Give a gentle roll to incorporate pink sugar into the dough. Cut cookies with a heart shaped cutter. Bake for 12 minutes then let cool. I've made these cookies without the sanding sugar and they're super-pretty so feel free to omit if you can't get ahold of pink sanding sugar? The best time to roll that sanding sugar on is when the dough has warmed up after the final roll out. If the dough is too cold the sanding sugar won't stick.